The northern hemisphere’s winter solstice has been a major festival for the past several thousand years. 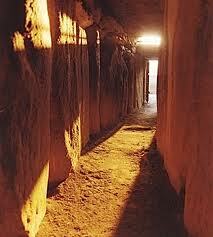 Newgrange at the winter solstice: the upper slot lets sunrise penetrate 60 feet into the mound. At Newgrange in Ireland, 1,000 years before Stonehenge (and 500 years before the Pyramids of Egypt), a 60-foot passageway was built with walls and roof of stone slabs, ending in a cruciform chamber, and the whole roofed over with an enormous dirt mound 50 feet high and covering an acre of land. Normally the passageway and chamber are dark, but for a couple of days at solstice a slot over the entrance lets the rising sun flood the chamber with light for a few minutes. A lucky couple of dozen tourists, chosen by lottery during the year, are allowed in for this magical moment. This suggests that the alignment of stones at Stonehenge was for the production of similar effects. The mound at Newgrange is still standing, but we don’t know what Stonehenge looked like. There may have been a mound at Stonehenge (there are other mounds nearby, notably Silbury Hill near Avebury), or else walls of wood and animal hides could have kept the interior dark except at the astronomically significant moments. Thousands of years later, during the rise of the Roman Empire, the Roman year-end festival of Saturnalia began to merge with the northern neolithic ceremonies and their Celtic and Germanic descendants, and with the virgin birth at solstice of Mithras the Unconquerable Sun-god. As early Christians looked for a way to separate Jesus from his Jewish roots and to make him broadly acceptable throughout the Roman Empire, his birth (which had probably happened in the spring) began to be celebrated at the winter solstice too. Merry Christmas! Io Saturnalia! Happy Solstice! – In the northern hemisphere, this is the time to celebrate that the tide of darkness has turned, and that light and life are beginning to return to our world. Peace! This entry was posted in Religion, Society and tagged Christmas, Jesus, Mithraism, Mithras, neolithic mounds, Newgrange, Romans, Silbury Hill, Stonehenge.